When you sit down to create advertising copy or blog content that enlightens a prospect, you’re not doing so out of the kindness of your heart. Even if that content is about the latest charity your company helped. You’re doing it because you seek a result. However, the authentic marketer must never adopt this mindset. 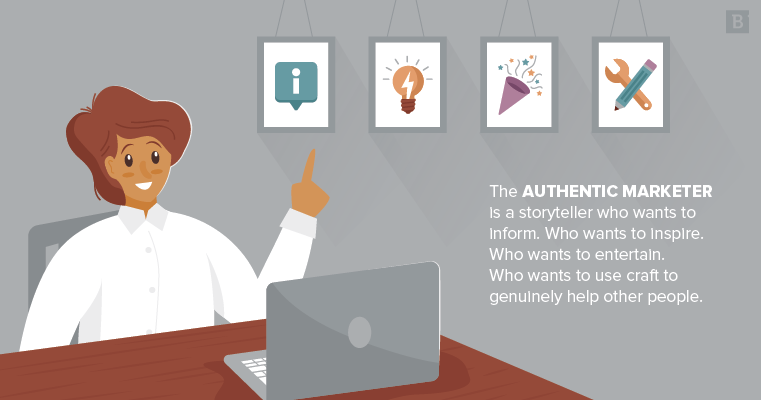 The authentic marketer is a storyteller who wants to inform. Who wants to inspire. Who wants to entertain. Who wants to use craft to genuinely help other people. How can this seemingly altruistic agenda align with real-world marketing goals? Such is the great riddle of authenticity marketing – one that we will unravel before the end of this post. Though it pains me to admit it, content marketing was anything but authentic when it came onto the scene in the 2000s. Brands were in a race to churn out as much keyword-laden content as possible because, at the time, they believed that was the answer to search engine optimization. And it sort of was. There was a time at Brafton when a writer might produce 4,000 words a day. We meticulously used specific keywords every 100 words or fewer; and that’s about the only thing that can be considered “meticulous” when you’re writing at a pace of 500 words per hour. Elsewhere, companies scurried to create offsite blogs that would link back to a brand’s website (this is an off-site SEO practice, and its intended purpose is to create page or domain authority by inundating the internet with webpages that link back to a company’s site). Then context became a thing. By 2013, Google’s Hummingbird algorithm could achieve word association. Now, semantic (or secondary) keywords can be understood so well that you could theoretically rank for a keyword that was only referenced once in your content. Google is more concerned with whether you captured the intended meaning of a keyword by covering topics associated with it, rather than just shoehorning it into every other sentence. Google got wise to that game fast. Today, it rewards good backlinks – that is, backlinks from pages that meaningfully address search queries. What we have here is the science of authenticity marketing on the web. Very simply, it was born out of Google’s desire to show users content that actually satisfied their searcher intent. The result? In a manner of speaking, it meant that content created for SEO purposes (on-site or off-site) needed to be quantitatively authentic. It’s a complicated question that’s best answered by talking about what you do and what you care about. Qualitative authenticity in marketing is about answering those questions for your brand and then turning them into marketing efforts. 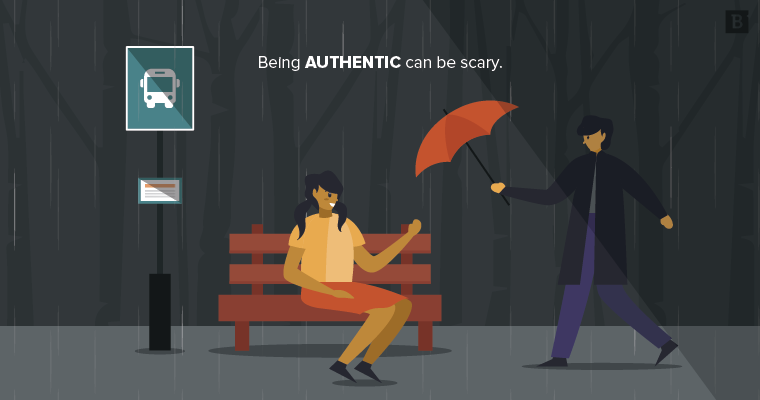 Being authentic can be scary. But when done right, you create the feeling among your audience that your brand stands for something. Start by thinking about why you went into business in the first place. On some level, it was about getting paid to help a customer solve a problem. But the fact that you’re monetizing your service doesn’t make the problem or the solution any less authentic. If your value proposition is legitimate, so are the feelings of frustration tied to the problem you solve. Or the relief felt upon resolution. Your goal is not to invent or contrive these feelings, but to demonstrate them through storytelling. FedEx could have written a monologue about how you live in a fast-paced world and need a delivery service that can keep up. They could have shown some stock images of planes landing, folks hustling down Wall Street and gesturing animatedly in conference rooms. Instead they crafted a script that demonstrates a day in the life of fast-talking workaholics. It has humor. It gets our attention. It tells a story in a familiar setting. Most importantly, it captures the reason FedEx exists as a business without forcing you to read a 500-word mission statement. This is B2B marketing that’s actually entertaining, and it was produced before I was born. Authentic marketing is not new, but when done right, it always feels novel. Authentic marketing is not new, but when done right, it always feels novel. For starters, you probably care about what your customers care about, or at least you should. Yes, this means optimizing the user experience. It also means ensuring product satisfaction and nailing the right service expectations. But first, it means being interesting to prospects by nature of the things you talk about on your website, social media pages and blog. Inbound marketing is an exercise in knowing your audience, understanding what interests them and then using that knowledge to tell stories that are either useful, informative, entertaining, inspiring or all of the above. This content builds trust if it feels genuine to the audience. It can’t be rife with overly general advice or rehashed thoughts from the latest industry news source. If the reader gets a whiff of an ulterior motive, you lose them. Suddenly, that pretense of authenticity is peeled back to reveal the underbelly of marketing: sales. How exactly do you practice authenticity marketing? You don’t have to model your content after what everyone else in the industry is doing. In fact, we would encourage you to think critically and creatively about everything you produce. Engage with topics truthfully and sufficiently strangle your sales instinct. Authentic content has intrinsic value. This is why you’ll almost never see a sales pitch in prose on the Brafton blog. It cheapens the value of what we’ve created. Nor will you see stock photography, because there’s nothing original about it. Sometimes when I read my old content, I flag where I’ve said something that sounds rehearsed, or was spoken out of a sense of obligation to make a concept seem more important than it is. In these moments, I ask, “Is that really what I think?” The truth is, I often forget that my experience and transparent opinions may be worth something to my audience. The same goes for you and your brand. Don’t be afraid to write from your own perspective. It will humanize you to your audience. Also, pass the mic to different experts in your company from time to time to tell a story from their point of view. Your audience will see the people behind the business, and hear a voice they haven’t already heard a million and one times. Put a face to these voices with bylines and a bio, too. Don’t be afraid to write from your own perspective. It will humanize you to your audience. The customer is the hero of his or her journey with your brand. Tell their tale of heroics, how they conquered inefficiency, discovered cost savings, vanquished downtime or slayed the cyberthreats that intruded on their domain with your brand’s help. You want your audience to see themselves or their own struggles in the people you’ve helped. Create case studies and testimonials that are gritty, that use real voices. Show the audience authentically pleased customers. Why should your prospective customers listen to you if you’re not willing to listen to them? Authentic brands care. And they can prove it by giving other people a chance to be heard through user-generated content campaigns on social media. Sometimes your customers would prefer to tell their own stories. And in return for giving them a chance to do so on your social media channels, they expose their network of friends and family to your brand. But misrepresenting your audience’s feelings (a la Pepsi’s plastic rendering of Black Lives Matter) will crash and burn. You won’t just look inauthentic; you’ll look luridly insincere. Manipulating or scaring customers to build brand recognition is also a big no-no. Remember how we said content needs to meaningfully satisfy searcher intent if it can be quantitatively authentic? There is a very scientific, data-driven approach to figuring out what that content looks like. It involves analyzing the top-ranking pages for specific keywords, identifying the topical aspects of that content and then touching on them in new branded content. Remember: Authentic brands always align marketing efforts with their core values. A brand isn’t human, but it can be humanized. How? Endow it with core values that people look for in other people: trust, reliability, consistency, warmth, humor, genuineness. You can’t just speak them. The substance needs to be there for it to be authentic. Prioritize depictions of these values by telling stories about them through your content; drop the sales pitch. These two steps comprise the DNA of all authenticity marketing. A brand isn’t human, but it can be humanized. What does the future of authenticity marketing look like? I like to believe that, some day, commercial agendas will always align with what the people behind the business believe to be right, truthful and sincere. Then all marketing would always be authentic marketing. It’s a lofty and perhaps impossibly naive musing. Unfortunately, a case could be made that influencer marketing contrasts this imagined future. One example was captured through Hulu’s Fyre Festival documentary, which reveals the role that influencers played in defrauding thousands of millennials and hundreds of investors out of millions of dollars. Another is John Oliver’s rant about undisclosed influencer marketing. He demonstrated his point by subtly, almost subliminally, advertising Scientology for an entire season. The millennial generation is supposedly high on authenticity, but influencer marketing is one trip that can go very wrong if brands aren’t careful to a) disclose paid relationships with influencers and b) align themselves with influencers for non-superficial reasons. I’ll also point out that authentic brands can earn media as opposed to paying for it. A captivating advertising campaign, original research, and a trustworthy blog with well-curated advice can draw attention from social media users, journalists and impartial industry commentators. But I wouldn’t say that authenticity marketing is in peril. Yes, transparency and authenticity on the web in general have reached an adolescence of sorts. “Fake news” and betrayal of user trust are travesterial, but they’ve been dormant growing pains since day one of the web. Something similar can be said for content marketing. In recent years, it’s gone from a mad dash to manufacture content to a thoughtful discussion about how to craft the right strategy and create content that works. Authenticity is the next talking point in this discussion. Case in point: this is the first time we’ve written about it on this blog.